This brand began and 2001 and ever since, Dylan’s Candy Bar has been making and creating gourmet candy that can please any palate. They offer a little bit of everything and something for everyone ranging from gummies to chocolates and everything in between. Everything here at Dylan’s Candy Bar would make a great gift for the loved ones in your life. Check out the popular gifts in the gift guide section of their online store. There is also a lifestyle section you can visit for non-edible gifts that are perfect for gift giving. I am a big fan of the apparel offered at Dylan’s Candy Bar! Current offers and deals at Dylan’s Candy Bar! It is Cyber Monday over at Dylan’s Candy Bar and right now they are offering FREE shipping on any order $25+ or more. They currently have some items on sale for Cyber Monday. You can see all of those crazy deals right over here! Also with coupon code FF25 you can enjoy 25% off your order at Dylan’s Candy Bar! This is a Dylan’s Candy Bar signature product right here. If you know a chocolate lover in your life, present this unforgettable gift to them and they will thank you forever and ever! There are a whopping 56 pieces of gourmet Belgian chocolates here! Flavors included in this awesome wheel of chocolate are Dark Raspberry, S’mores, Milk Toffee Crunch, Hazelnut, Dark Espresso, Almond, Caramel, and Milk. There is also a fun Lollipop Wheel available if chocolate is not your thing. Each Lollipop Wheel features the following flavors: Strawberry-Banana, Cherry, Blueberry, Gumball, Orange, Apple, Watermelon, Banana Split and Cotton Candy! This is a great deal and would be perfect for gift giving this Christmas season! The Dylan’s Candy Bar Signature Tackle Box would make a lovely gift for the sweet tooth that has a passion and appreciation for sour candies! Contains Sour Rainbow Belt Bites, Sour Patch Watermelon Slices, Sour Gummy Bears, Sour Blue Cola Bottles, Sour Worms and Sour Looms. Craving hot chocolate but don’t want the norm? I don’t know about you but I am bored with typical and this Magical Unicorn Hot Chocolate is anything but typical. It is PINK hot chocolate! I bet this hot chocolate would delight the little girl in your life! Where are my Oreo lovers at? My husband, Joe, is a big-time Oreo fan. When I get him a bag of Oreos he immediately does a line of them. It is as if he doesn’t have any self-control around Oreos! If you know someone like that then these chocolate-covered Oreo cookies would be perfect for gift giving. There are 9 in the stack and these are sure to dazzle and delight the taste buds of any Oreo fan! Heads up candy sprinkles and marshmallow lovers! Dylan’s Candy Bar has your dream pop right here. This is totally right up my alley here. I love both of these things and combined?? MINDBLOWING! Can you say YUM! Be sure to also check out these Dylan’s Candy Bar Jumbo Marshmallow Pops! This gummy tower is a foot tall and full to the brim with your favorite gummy candies! This gift set includes Sour Patch Watermelon Slices, Rainbow Gummy Bears, Swedish Fish, and Red Australian Licorice. Talk about nostalgia! Dylan’s Candy Bar nailed it with this time capsule. These candies are all reminiscent of this era that is long gone. This decade may be done and over with but you can still enjoy the favorites from this time period. This is such a colorful, fun robe from Dylan’s Candy Bar. This robe is totes adorbs and it is my style completely. If anyone wants to wrap this up and put it under my Christmas tree I would be totally down for that! WINK! Simply just click the images to shop! 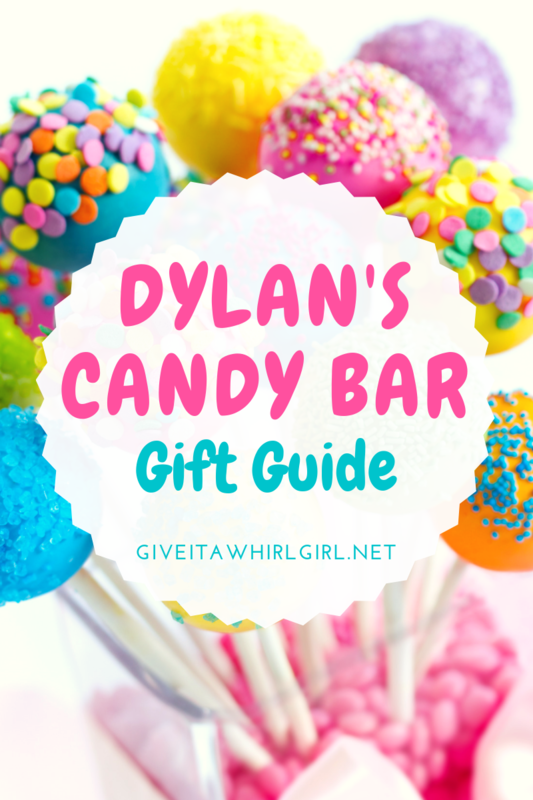 What is your favorite item from this Dylan’s Candy Bar gift guide? Leave me a comment and let me know what you are craving. This entry was posted in Manic Monday, Shopping Guide and tagged candy sprinkles, chocoalte, coffee mug, coupon, Cyber Monday, dylan's candy bar, gift, gift guide, gifts, hot chocolate, kebab, lollipop, marshmallow, mug, Oreo, pretzel, rainbow sprinkles, robe, sale, shopping, shopping guide, sour candy, unicorn. Bookmark the permalink. These candy’s are perfect stocking stuffers ideas! They are definitely perfect for that AND also splurging and treating yourself. 😁 I need to treat myself. I’m always a sucker for candy, but that robe might be my favorite!! Yes! I want that robe too. Might need to add it to my wishlist for Xmas! Oh fun! I love candy – and this would be great for a Christmas party or to give as a gift! These would thrill my kids! I love the oreos!